Mwingi woman who was expected to resurrect is buried five years after her death – Kenyatta University TV (KUTV). All Rights Reserved. Residents of Ndaluni village, within Kyome Thaana ward, Mwingi west sub county of Kitui county turned up in large numbers to witness a bizarre happening which left them with lots of unanswered questions. Ndila Munyoki lost her life in 2014 and has been laid to rest today together with her daughter who died in 2013. 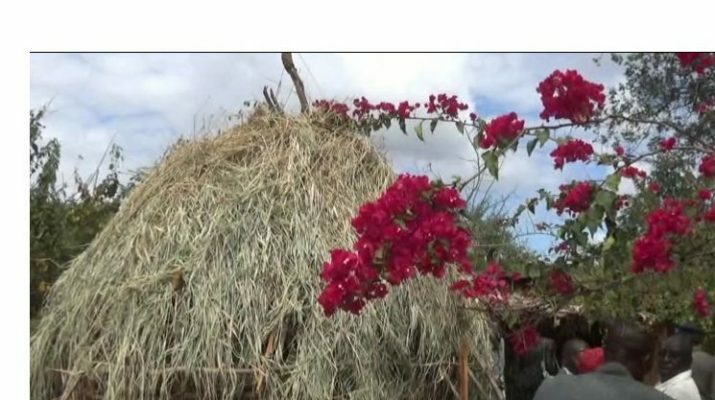 The Assistant chief, Ndaluni Sub Location Jackson Mbiti who had attended the burial was delighted to have finally laid the woman to rest after four years. According to her husband, Kitu Munyoki his wife succumbed to tuberculosis while the baby was unable to breast feed leading to her death. The couple preserved the one year old’s body in their home and a year later the wife passed on. ‘My beloved wife told me before dying that she will come back to life after seven years and that’s why i lived with her body for those years waiting for her comeback,’ Munyoki said. Kitu Munyoki revealed to journalists that his wife had gone to ‘write a Bible’ and that she will come back to save people seven years after her death. ‘I have not gone, i will come back,’ Kitu recalled his wife’s last words. The father of two who was arrested after members of public informed police about him living with dead bodies and served a 6 month jail term, added that it was his wife’s directive not not burry her for she would come back. Efforts to determine the religion this couple belonged to bore no fruits for Munyoki insisted that he does not belong to any religion but he prays to his ‘god’. However, Ausini clan elder, Alphonso Muli said Munyoki could be a member of an unknown cult for his practices were strange.